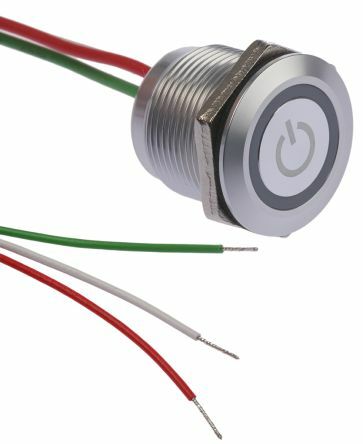 These illuminated, capacitive touch switches are a revolutionary design eliminating the need for panel cut-outs and the worry of ingress protection. When using these switches all you need to factor in when designing the panel lay out, is the position of the switches and the size of switches you require. Any glass, clear acrylic, plastic or similar panel sheet can be printed with your required design and these units simply stick to the back. The switch works through the panel giving full RGB illumination with an unmatched uniformity of illumination. As the switch works through the panel, there is no need for any panel cut-outs. There are several benefits to this, more than just not worrying about O-Rings and mounting nuts. It means when the front panel is sealed to the rest of the enclosure you are left with a smooth surface that is easily cleaned. Ideal for medical applications as you can wipe the panel clean with disinfectants (make sure that the print is compatible) and not worry if it will corrode any switch seals. As long as the panel is sealed to the rest of the enclosure, then ingress protection is no longer an issue. These devices also feature an extremely low profile making them ideal for use in portable devices. They work off a wide voltage range of 6 V dc to 28 V dc making them compatible with most panel circuits. A pre-wired cable is available separately for quick connection, see stock number 823-2252. The above video gives a great representation of how the switches work. The list of applications these switches can be used in is endless. From marine monitoring equipment, medical equipment, defence systems, safety and alarm panels all the way to professional audio and broadcast equipment and even agriculture, building services and automation plus many more. If a panel requires switches and you want illumination with a clean, smooth, professional finish then these switches are ideal. The 20mm switches can be used in panels up to 7mm thick and the 35mm version in panels up to 11mm thick. The 35mm version also has sensitivity adjustment. For illumination requirements then most transparent materials that allow light to pass through can be used.